, a dramatic and miscellaneous writer, was the son of sir John Sedley, of Aylesford in Kent, by a daughter of sir Henry Savile, and was born about 1639. At seventeen, he became a fellowcommoner of Wadham college in Oxford; but, taking no degree, retired to his own country, without either traveling, or going to the inns of court. At the restoration he came to London, and commenced wit, courtier, poet, and man of gallantry. 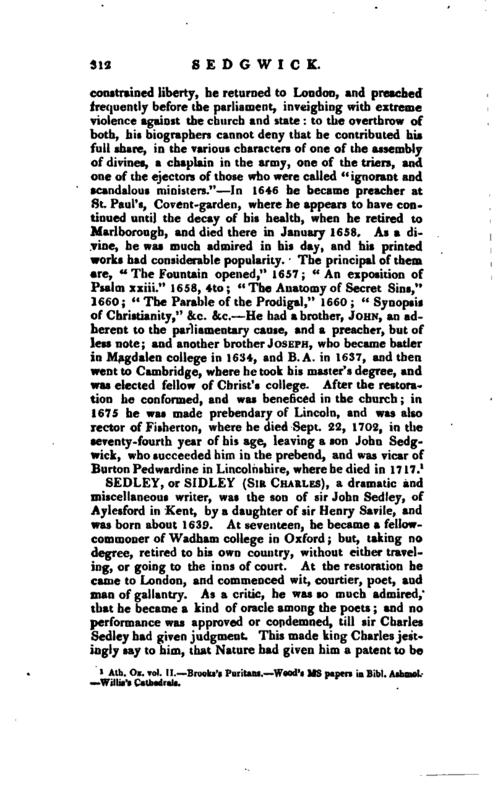 As a critic, he was so much admired, tfiat he became a kind of oracle among the poets; and no performance was approved or condemned, till sir Charles Sedley had given judgment. This made king Charles jestingly say to him, that Nature had given him a patent to be | Apollo’s viceroy; and lord Rochester placed him in the first rank of poetical critics. 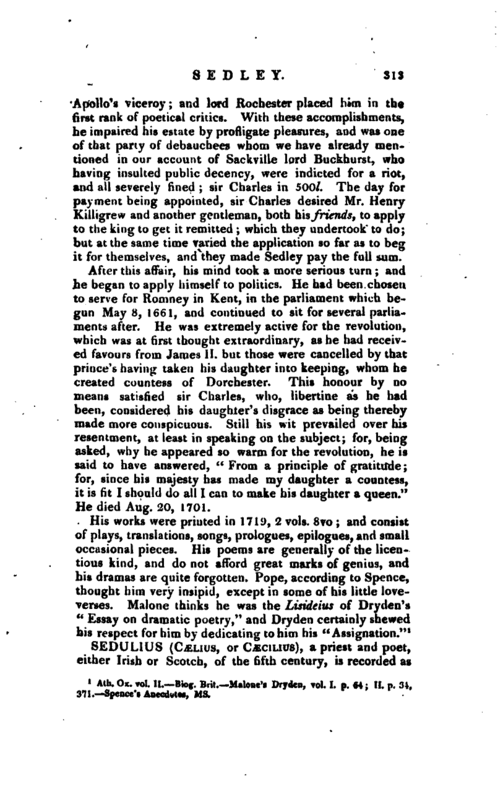 With these accomplishments, he impaired his estate by profligate pleasures, and was one of that party of debauchees whom we have already mentioned in our account of Sackville lord Buckhurst, who having insulted public decency, were indicted for a riot, and all severely fined; sir Charles in 500l. The day for payment being appointed, sir Charles desired Mr. Henry Killigrew and another gentleman, both his friends, to apply to the king to get it remitted; which they undertook to do; but at the same time varied the application so far as to beg it for themselves, and they made Sedley pay the full sum. After this affair, his mind took a more serious turn; and he began to apply himself to politics. He had been chosen to serve for Romney in Kent, in the parliament which begun May 8, 1661, and continued to sit for several parliaments after. He was extremely active for the revolution, which was at first thought extraordinary, as he had received favours from James II. but those were cancelled by that prince’s having taken his daughter into keeping, whom he created countess of Dorchester. This honour by no means satisfied sir Charles, who, libertine as he had been, considered his daughter’s disgrace as being thereby made more conspicuous. Still his wit prevailed over his resentment, at least in speaking on the subject; for, being asked, why he appeared so warm for the revolution, he is said to have answered, “From a principle of gratitude; for, since his majesty has made my daughter a countess, it is fit I should do all I can to make his daughter a queen.” He died Aug. 20, 1701. Ath. Ox. vol. II. Biog. Brit Malone’s Dryden, vol. I. p. 64 i II. p. 34, 371. Spence’s Anecdotes, ms.